Each year, one insect spends six generations traveling to and from one particular region in Mexico. Their journey spans multiple countries and various climates, and has played a vital role in uniting cultures in North America. One DeKalb County School District School (DCSD) has joined this process, spreading knowledge and goodwill in equal measure. Sagamore Hills Elementary School celebrated a schoolwide STEM (science, technology, engineering, and mathematics) Day on Sept. 14 as well as the beginning of Hispanic Heritage Month, which spans Sept. 15 until Oct. 15. As part of the festivities, the school welcomed Estela Romero—an Angangueo, Mexico reporter—to speak on the subject of monarch butterflies. Sagamore Hills has dedicated a hefty portion of STEM study to monarch butterflies. Second-grade students have built and planted three pollinator gardens, which have been certified by the national network Monarch Watch and included in the Rosalynn Carter Butterfly Trail, and committed to planting new pollinator gardens on school property. Third graders include monarchs as part of their curriculum, while fifth graders study monarch DNA to determine which specimens are healthy. “This year, the entire school will participate in monarch-related STEM projects,” said Stephanie Spencer, STEM teacher at Sagamore Hills. Each spring, monarch butterflies begin a migration process in the Angangueo region. 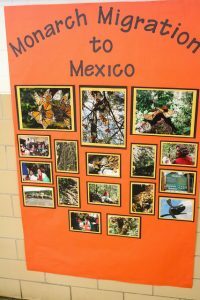 Over the course of approximately five life-cycles, monarchs travel from Mexico and other tropical climates to various parts of the United States and Canada. During autumn, for reasons that involve many environmental and unknown factors, the sixth generation returns to where the original generation was born—typically the Angangueo region, southern California, Florida and the Caribbean. Many scientists call the migration one of the most spectacular natural phenomena in the world. Many monarch enthusiasts—including students at Sagamore Hills—place tags on the butterflies’ wings to mark their place of birth. Biologists who specialize in monarch study often find these tags in Angangueo. According to Romero, in Mexico, this migration represents more than just a biological phenomenon—it represents a connection to the past. When Romero was a child, two American men—Lincoln Brower and Bill Calvert, who are considered pioneers in monarch butterfly biology—visited her village asking about the monarch butterfly. Romero’s family showed led them to the migration area, not knowing they were helping shape science history. Ever since that day, Romero has been fascinated with the monarch butterfly’s lifecycle. Today, she helps coordinate Symbolic Migration, which links children in the United States with those in the Angangaueo region. 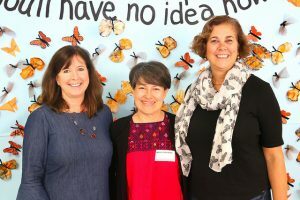 Each fall, she travels throughout North America to speak at local schools and collects more than 60,000 messages intended for Angangueo children. In accordance with the actual monarch migration, when spring arrives, Romero will return these messages to their point of origin with reply messages from Mexican students. Principal Julie Taylor considers the wisdom imparted by Romero invaluable to Sagamore Hills’ STEM journey. For more information on Sagamore Hills Elementary, visit the school website. For more information on Symbolic Migration, visit journeynorth.org/symbolic-migration.